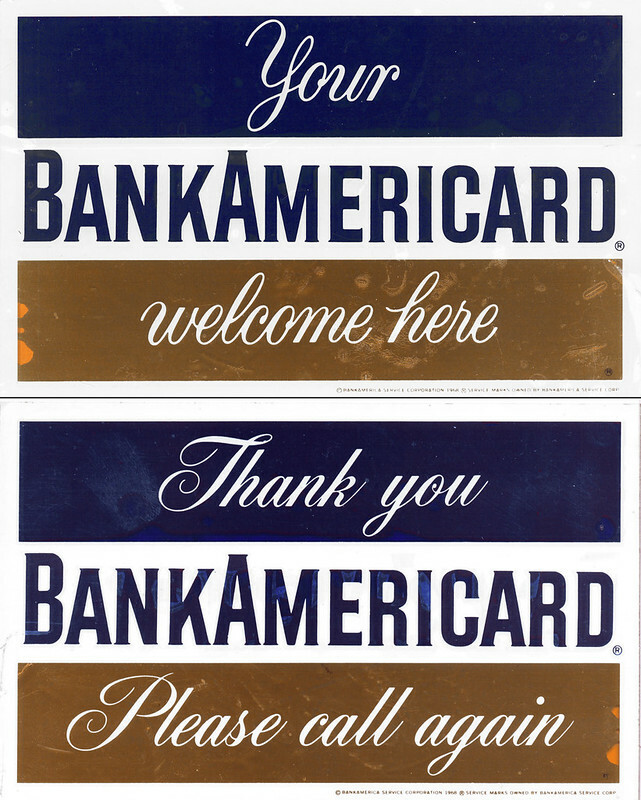 Bank of America launched its BankAmericard credit card program in 1958; by the following summer over two-million cards had been issued throughout California via unsolicited mailings, and 20,000 merchants were accepting them. Facing competition from Master Charge (formed by a coalition of competing banks); the system expanded and was licensed to other banks in and outside the United States in the decades that followed, eventually growing too big even for Bank of America to continue operating. Using the same type of management infrastructure that launched Master Charge, the issuing banks formed National BankAmericard, Inc. in 1970. Six years later, in a move to distance the company further from Bank of America: BankAmericard and its international counterparts – BarclayCard, Chargex, etc. – were unified under a new name: Visa, while retaining the blue/white/gold colors. This acceptance mark (front and back, shown) was recovered by a buddy of mine on the first visit to Dixie Square Mall, in 2009. In years-past, a number of these could still be found on the few unbroken windows throughout the mall, however at that point this was the last one remaining: hiding on a removed pane of glass being stored in one of Turn-Style’s fitting rooms. By the following year it had been shattered by vandals.